Lemon is one of my favorite flavors – EVER! Not only is it delicious on it’s own, but it enhances so many dishes by brightening the overall flavor. The juice contributes tremendous tang while the rind is full of potent citrus oils. Using both in combination packs a great lemony punch. I use fresh lemon in many savory low carb recipes on the blog like pork picatta, lemon rosemary chicken wings, or Moroccan chicken. My favorite recipes which include lemon are low carb desserts! Low carb lemon bars are a favorite followed by lemon curd which is good on everything from low carb cake to lemon curd pie. 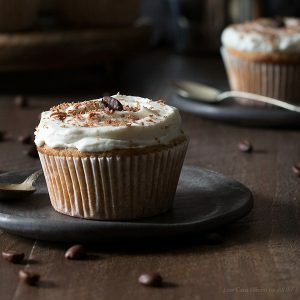 The lemony flavor in these sugar-free cupcakes is awesome. The acid from the lemon juice reacts with the baking powder providing a nice rise and the lemon zest helps strengthen the lemon flavor. 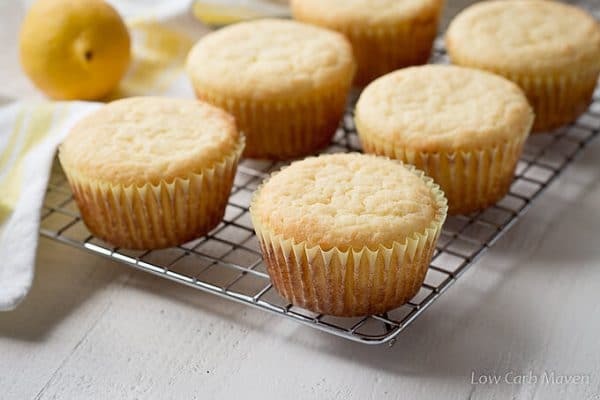 But to make these lemon cupcakes really stand out, I added LorAnn Lemon Oil. This is an extremely concentrated product which has superior flavor. It’s much better than lemon extract. The texture of these sugar-free cupcakes is almost like the real thing. No one would believe they were eating a low carb cupcake. And the whipped cream cheese frosting compliments the cupcakes very nicely. You could add some lemon oil to the cream cheese frosting if you want, but I didn’t and they were fine. Want to know how good these were? My son had four while my husband and I were lucky to get one each! 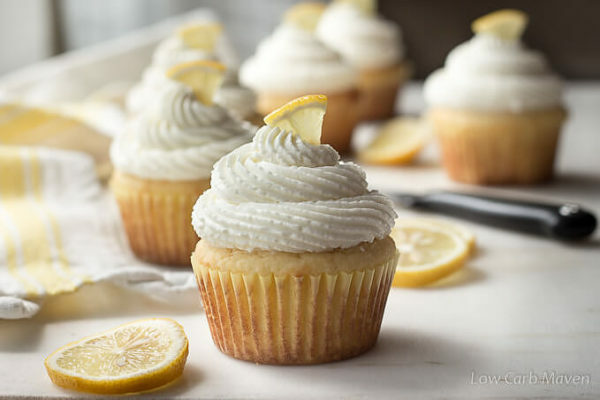 Sugar-free Lemon Cupcakes with Cream Cheese Frosting are 4 net carbs each. 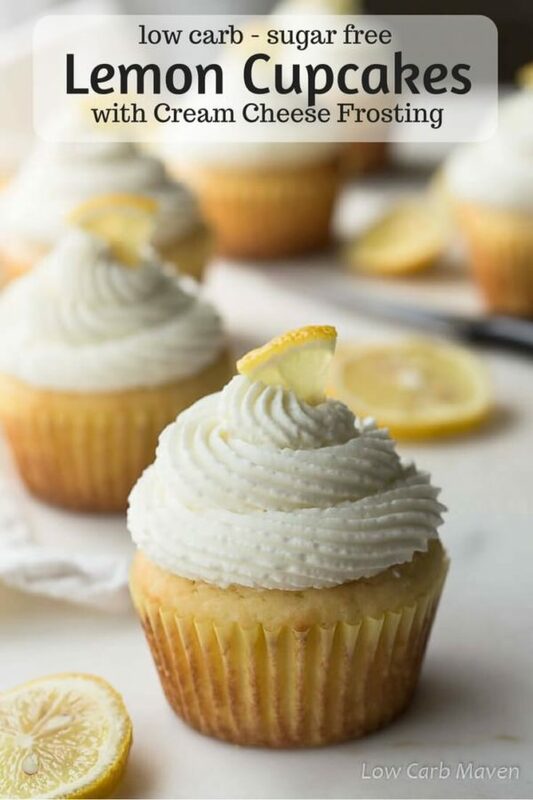 Fluffy sugar-free lemon cupcakes topped with whipped cream cheese frosting make the perfect low carb keto dessert. Cream Cheese Frosting: (A stand mixer works best, but a hand mixer works, too.) Whip the cream cheese to loosen it. Add the powdered sweetener and whip. Adding the heavy cream a little at a time, mix until incorporated, then whip until the frosting is stiff and fluffy. Use right away or cover and refrigerate until needed. Preparation: Preheat the oven to 350 degrees F. Position the rack to the middle of the oven. Zest and juice the lemon. Line a 6 well muffin pan with cupcake liners. In a small bowl whisk the coconut flour, baking powder, and salt together to break-up any lumps. Add the lemon juice to the heavy cream. Method: In a medium bowl beat the first 6 cupcakes ingredients until light and fluffy (1-2 minutes). Add one egg and beat into the butter mixture until the mixture is light and fluffy (it may break or separate, it’s okay). Add 1/3 of the dry ingredients and mix until completely incorporated, making sure to keep that light, fluffy texture. Keep in mind that we want a light and fluffy - almost mousse-like texture throughout this process. Add another egg and beat until fully combined. Add half of the remaining dry ingredients, beating again. Add the last egg, beating until fully incorporated, followed by the last of the dry ingredients. Finish by adding the heavy cream, beating until the batter is thick, but still light and fluffy. Spoon the thick batter into a plastic zip-loc bag and snip off a corner, producing about a 3/4-1 inch hole. Place the snipped corner into a muffin liner and squeeze the batter into a fat, rounded mound, filling the muffin liner about 3/4 full. Repeat for each muffin liner, adding any remaining batter to those that need a little more. Knock down any peaks with your finger. Lift the pan a few inches off the counter and let it drop. Bake: Place the pan into the oven. Turn the oven up to 400° degrees for 5 minutes. Then, turn the oven back to 350° and bake the lemon cupcakes for 15-20 minutes more. They’re ready when they feel firm when lightly pressed with a finger, but still sound moist. Remove from the oven and let cool five minutes before gently removing from the pan and placing on a cooling rack to cool completely before frosting. Frost: Cut the tip off of a quart size zip-loc bag and insert a large open-star tip. Spoon the cream cheese frosting into the bag and twist the bag above the frosting. Starting on the outside edge of the cupcake, squeeze the frosting in a spiral making it smaller in diameter while piping. If it's not perfect, scrape the frosting off and add it back to the bag. Keep the lemon cupcakes covered and refrigerated for 5-7 days. Makes 6 very generously frosted cupcakes. Hi Kim. I have a question rather than a comment. 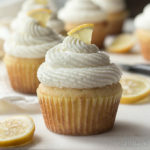 In your recipe for lemon cupcakes, you say that Swerve can be substituted instead of Sukrin. Is it 1 cup of Swerve to 1/4 cup Sukrin? I wanted to make sure because this recipe looks absolutely delicious and I want to try it. Thank you. This is SO good! I doubled the recipe but made it without the frosting (I blame laziness.. lol) and it was still absolutely yummy. I didn’t have any lemon oil so I used 1 teaspoon lemon extract and the juice of two whole lemons, and that seemed to do the trick. For my sweetener I used Erythritol plus 1/4 teaspoon each of powdered Stevia and monk fruit sweetener, and I also upped the liquid Stevia to 60 drops to suit my husband’s palate. The baking times are spot on, mine took 20 minutes at 175 C after the first 5 minutes at 200 C, and they turned out moist, tender, not eggy at all, and exceedingly moreish. Thank you so much for another fantastic recipe! PS. For someone who was asking, without the frosting each cupcake ends up at approximately 217 kcal, 5.1g total carbs, 2g fibre, 3.2g net carbs, 5.8g protein, and 19.3g fat. I have made several attempts at low carb baking, but this is the first recipe that I consider a success. My husband who is not doing Keto also loves them. The only thing I did differently than your recipe was add a tsp of Xanthan gum to the batter. They turned out perfect. They had a good texture and tastes really good. I made your chocolate zucchini muffins and they were great. First low carb baked good I’ve made that was edible. I’ve found I detest things made with almond flour for some reason. I wonder, could this recipe be adapted to remove the lemon, add in a little cocoa and red food coloring to make a red velvet cupcake. Thanks for your recipes! Thank you Kim! I’m going to give it a go! These look so good! How do you calculate the nutrition facts? 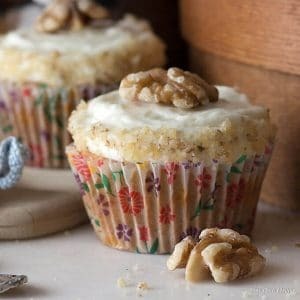 These are super moist and yummy! It needed lemon in the icing though for more flavour. Great recipe!! Thank you so much for sharing! I absolutely cannot believe how good these are. Wonderful recipe! These cupcakes were delicious, especially the frosting. My first real dessert being on the keto plan. I brought them to a dinner party as dessert and everyone enjoyed them. I didn’t have the lemon oil so I used just a little more lemon juice. While you could taste lemon, I plan to use lemon oil the next time for stronger lemon flavor. In re-reading your description, you mention that the lemon juice reacts with the baking soda providing a nice rise, but the ingredients list baking “powder”. Can you clarify which to use. Thanks! Good evening Kim! I’m still seeing Baking Powder on the ingredients list. Is it supposed to be baking powder or baking soda? Kim, if you were close by, I’d hug your neck. The Lemon cupcakes were the finishing touch to our white chicken Enchiladas. I’m so thankful I happened upon your web page. I’m 4 weeks into a keto diet, and was beginning to wonder if all recipes were “blah”…. you proved me wrong. I’m an avid fan of yours! How much calories with these cupcakes how much less calories would these cupcakes ave without the frosting? These are perfect! I made them to take to a friends house as a dessert to her dinner. They are not keto but I was hoping they would like them. They loved them! Even said they looked like they were from a bakery. I made dehydrated lemon zest and took this opportunity to sprinkle a bit on top of each one. They looked so pretty. I didn’t have any lemon oil so I used orange extract along with the lemon juice. Next time I will use lemon extract. Thank you for this recipe! Came here to say Thank you for your website/blog, and specifically this recipe. Like you, I love anything lemon! I did not have lemon oil on hand, but had Flavorganics Lemon Extract. They came out wonderful. My husband who despises coconut, spotted it right away- for its texture. I realized, I did not use the specific brand you recommended. Is Bob’s Mill super fine And does not result in the tiny granules in the end product? Next time I will try to pulverize my coconut flour. But even with the grainy texture, I loved the cupcakes! Oh, and mine turned eight, not six…had to stretch the frosting a tad.Thank you, again! I’m interested in your frosting. It’s very simple and I like that. I’m making a 3D birthday cake and need a frosting that can hold up to being colored and pipped. Does your frosting harden a bit? Are these 6 larger cupcakes? Could I use a standard sized pan? Thanks, love all of your recipes. Thanks Kim. I need a doz, so i will double. I made these as written. They have a wonderful texture, but I didn’t care for the lemon oil so next time will leave it out. This is really a delicious recipe that can be modified for a variety of flavors. I made vanilla ones today. Your website has great recipes, BUT the ads that continually pop up in the middle of the page are so annoying that I leave your site and go to another site that doesn’t have the crazy amount of ads that your blog does. You have continuous ads on the side and popping up at the bottom, AND popping up in the middle of the page. That is ridiculous and too much. I use my laptop to look at recipes when I am cooking in the kitchen. When I use my phone to look at your website, there are not near as many ads as when I use my laptop. Thank you for looking into this matter! Just made these and they were so worth it. Believe me when I say they are good and easy to make. I have tried a lot of recipes and thrown a lot away. I did add a teaspoon of vanilla to the frosting. This recipe will be saved and made regularly. The taste of the cupcakes were great I didn’t throw them out like you said ingredients are spendy. I just put a bit more frosting on them lol. I used swerve for the sweetener. I think you hit the nail on the head with the coconut flour being packed. That is probably where things went wrong. And over cooking. But the taste was great!! Thank you for all your recipes and for your help!! Thanks Kim. I made them and the tops turned out more like a drop biscuit. They were a bit dry but I think I over cooked them. I’m new to low carb and the baking process of it. Any suggestions on what I might of done or didn’t do. Thanks again. Great recipes and I enjoy trying most of them. Would lemon extract work in place of lemon oil? Just made these this weekend. Couldn’t find any icing sugar so I made a sugar free lemon mousse to top it with. They were delicious!! I did cook them a tad too long, though. But now I know for next time!! Thanks for the recipe!! Could you use a ice cream/cookie scoop to put the batter into the cupcake liners instead of piping them? They came out delicious! My family knew they were sugar free (because I’m the one that made them), but they couldn’t believe they were gluten free. These look yummy!!! Have you ever tried them with almond flour instead of coconut? I mean, I know I’d have to make adjustments, just wondering if you knew how they’d come out. Happy early Mother’s Day to you!